To create awareness to prevent Child Labour and to support promotion of education for children Tharuni Warangal organized a Rally and a Meeting at Warangal under Girls Advocacy Alliance Project of Terres des Hommes, Netherlands on 12th June 2017. Hon'ble Judge and DLSA Secretary Mrs.Annie Rose Christina as Chief Guest;Dr. K. Anitha Reddy, Chair Person, CWC,Mr. Shankar, Dy. Commissioner,Dept. of Labour; Mrs. Sailaja, Dt. Welfare Officer were the Guests of Honour for the Programme. The Rally was attended by more than hundred people, including Anganwadi Teachers, ICPS representatives, Child Line and NGOs Representatives. 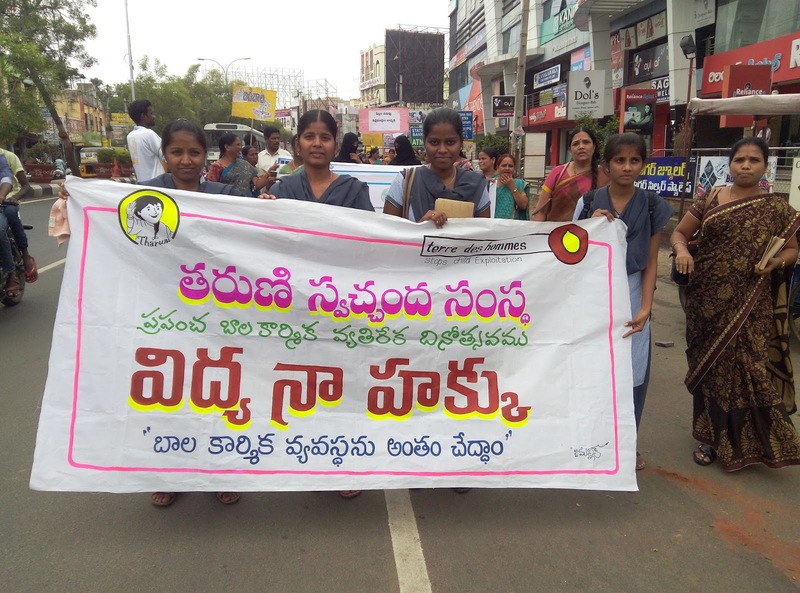 The Rally was held from MGM Hospital Gate to Warangal Chowrastha,with Children . Stickers were pasted on Road side walls. Placards,were displayed against Child Labour and importance of educating the children. A meeting was held at the end and Guests shared their valuable ideas against Child Labour.